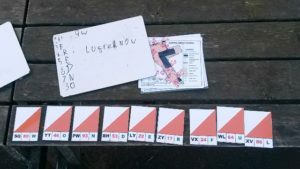 This half term I have planned, organised and delivered my first 5 day week of full programs of Orienteering coaching for 5 different schools. 3 of these Schools have hired me to make them a map for future use when I hand on the session plans to them, as Poolemouth sites they benefit from being able to take groups off site easily to Wessex Orienteering Permanent courses- at Kings Park and Darbys Lane. Some of the children have informed me they printed off maps of our Parks courses and went there with parents, which is great! Families are always welcome at our events and activities and there will be people happy to get you started off- so if youre reading this curiously come along to something! Its exciting to have two pairs of them close enough together to compete in inter-schools challenges in their neighbourhoods. 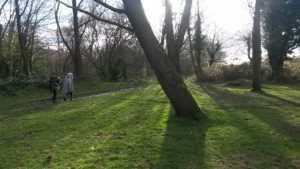 Hayeswood in Colehill also benefit from being near By the Way Field which has its own POC (Permanent Orienteering Course) for them to use. The two schools below completed a six week scheme of work for year 5 including Elements of teaching below, weekly 1 hour sessions with an indoor theory aspect and outdoor P.E element. Plus one prior visit to the terrain used for the final weeks competition, this is of a 2.0 KM distance appropriate to the age range, and this season has been line courses of Odd and Even control numbers in the same area to keep students separate and consolidate their independent navigation skills. Using Electronic timing I can then also share the results from both schools as a form of inter-schools competition. Looking forward to sharing these with them after this weeks competition. Taking groups offsite from schools seems to get harder every year, with the necessary precaution of gaining enough parent helpers and considering the risks sometimes too much of a barrier to staff. However the rewards for the children are so great, what surprises me is how few of the groups have been to these local parks, even when they live less than a mile away. Darbys Lane for example joins both the Poole schools, but the children are more familiar with the Adastral road that bisects the Canford Heath Estate, the distance between them is less than a mile- yet car dependency in the area shapes their limited knowledge of the area in which they are growing up. I’m glad to be able to provide this alternative curriculum. If you know of schools that also can leave site and be in one of the following without crossing a road, do pass this on to Senior Leadership Teams in schools. Bournemouth -Slades Farm (also Velodrome location) Queens Park. In Poole- Hamworthy Park, (We opened officially last weekend) Upton Country Park and soon to be Alexandra Park (Upper Parkstone). Example Scheme of work from this term with actual details of series. Week 4. Indoors Star Activity- Navigation practice on classroom maps of Kings Park school field, direction finding to controls using 16 points of compass.